Dates and bar fights and intrigue, oh my! It’s Valentine’s day and you know what that means! DATE NIGHT BABIES! With Bizarro holding down the fort Artemis takes Jason out on his third date ever (what with being dead that one time and all…) and they spend the night on the town, seeing all the best sites in Gotham. Back home, Bizarro is enjoying some quality alone time – in a kryptonite bubble bath, of course – while unknown to everyone Lex keeps an eye on them all and we finally get a clue as to who’s been stalking Jason. This issue is a lot of fun, which, considering the amount of intrigue, is surprising. We get so many genuinely giggle worthy scenes: Jason’s utterly flummoxed reaction to Artemis in a dress; Bizarro’s entire ‘relaxing evening in’ outfit; the bar scene, my gawd, the bar scene! ; that it’s easy to not notice the entirely disturbing plot going on. Biz is showing increasingly unhinged behavior; Jason and Artemis finally admit to each other that, despite their hopes, something is definitely wrong with their friend; and the reveal that the gang is facing an enemy they literally cannot comprehend all serve to make this the most plot moving issue in a while. 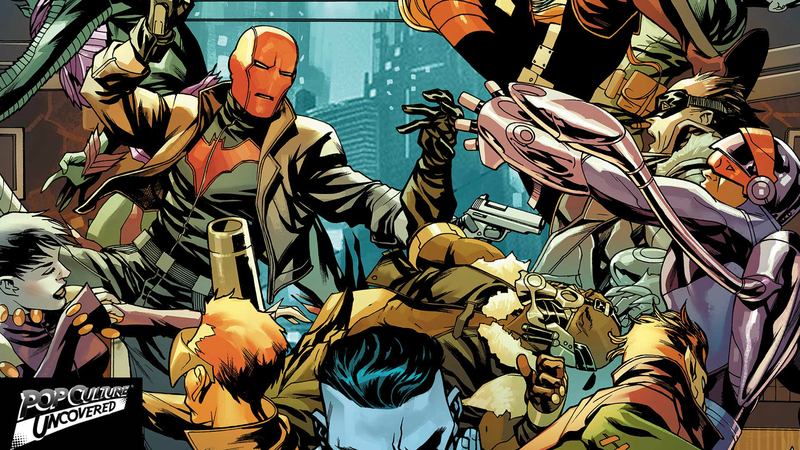 Usually I’m not of fan of guest artists, and while this particular style of artwork doesn’t quite mesh with RHATO’s usual aesthetic it does work well here. Marcio Takara, Rob Schwager & Felix Serrano bring a very specific yet odd tone to the proceedings: angles that are a shade off, colors that are almost over-saturated, strangely framed characters. It all goes to enhance the story making the potential villain of the piece even more disturbing than he (she? it?) already are. Overall I grinned my way through this issue even as I began to be genuinely afraid for our beloved Outlaws. To me? That’s a job well done. 5 shots out of 5.